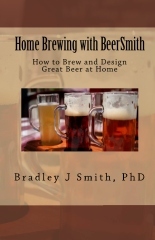 A collection of some of the best articles from the BeerSmith Home Brewing blog – now organized into book format for easy access. I think there is an article here for brewers of just about any skill level. I hope you enjoy the new guide. Would you like to get more articles sent to you? Receive more beer brewing articles delivered weekly to your inbox. Subscribe via email – it is completely free. Brewing Water: Hard or Soft?